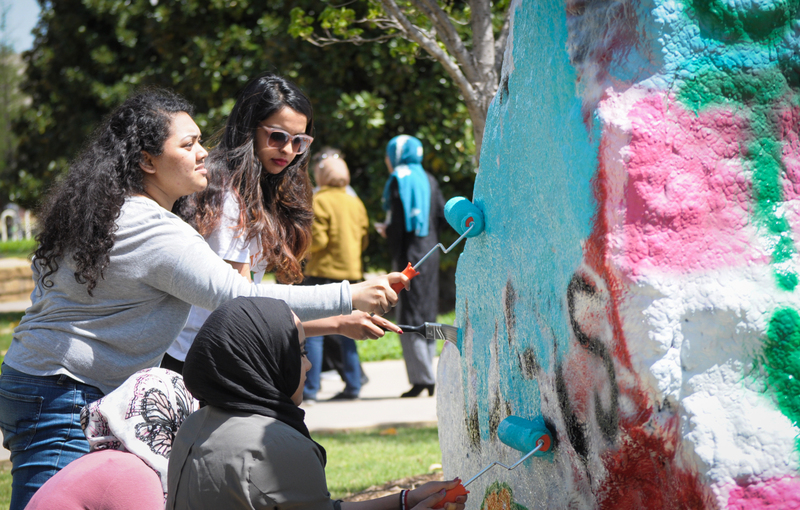 Mu Delta Alpha members paint the Spirit Rocks to spread awareness about sexual assault on April 4. The sorority was first established as a student group before it was converted into a Greek organization in 2017. Photo by Madeline Ambrose | Mercury Staff. Originally established as the organization Muslimahs for Change by alumna Samira Maddox, Mu Delta Alpha was founded at UTD and has recently evolved into a professional sorority. MDA started with three members, but now has 40 active members and is inducting 17 pledges as part of its epsilon class this semester. MDA President Umaima Nasir, a global business and supply chain management senior, said the sorority achieves Maddox’s goals by empowering them in both their academic and professional endeavors. “There are a lot of Muslim women that are in the UTD campus, and I feel like there’s not a single organization that’s recognizing their identity as Muslim, but also how they’re excelling in their studies and how they have these amazing leadership qualities,” Nasir said. Nasir said that traditionally, professional sororities are major-exclusive, but MDA sisters pride themselves on the diversity of the career paths taken by its members and how the professional development events can benefit everyone involved. Instead of a shared career path, their faith is the binding factor. This commonality is why Iman Abdelgawad, a psychology and child development sophomore, joined. Mu Delta Alpha’s mission is to empower Muslim women at UTD. Its alpha class was established in 2016. Photo by Madeline Ambrose | Mercury Staff. One way the sorority is empowering young Muslim women is through the Young Muslimah Summit the MDA hosts. The event draws in prominent Muslim women from around the country to speak on their leadership experience and inspire attendees to be proud of their faith, even in the professional world. They also host resume workshops and Muslim women from the Dallas community as speakers. Abdelgawad said MDA has empowered her personally, allowing her the opportunity to serve as a positive figure for empowering younger Muslim girls — a resource she did not have beyond her family in her community growing up. The organization was initially given a 10-year timeline to become a sorority, but it expanded in less than three years. UTD required the sorority to begin as an organization before becoming an official entity. MDA has expanded beyond UTD to the University of Texas at Austin and the University of North Texas, and in the fall it will introduce two new chapters at two more universities in the United States. Now that the sorority has founded their national chapter, Nasir said she hopes to leave her legacy for future generations of Muslim women at any school in the country. “Although we are a new sorority, we are trying to change as much as we can — change the people’s mentality that we’re around, tell them that whatever they think of Muslim women through the media is misleading, and we’re just girls that are trying to go and reach their highest potential in their career fields,” Nasir said.